Like many folks, Curt Swan was THE definitive Superman artist, having worked on the character for decades with exceptionally long runs on Action Comics, Superman and Jimmy Olsen with more than a few issues of Lois Lane, Superboy and World's Finest. He wasn't the only person to draw the man of steel through those years, of course, but he was the most prolific and most consistent, both in terms of just being on a book month in and month, as well as artistically rendering the characters with almost no variation regardless of the angle or expression -- they always looked like the exact same character. Despite Swan's omni-presence in comics for the entire Silver Age and years on either side, I knew very little about the man himself. 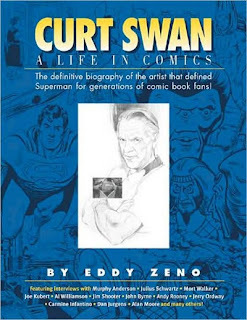 So when I found a copy of Eddy Zeno's Curt Swan: A Life In Comics, I picked it up with interest. Zeno did a great amount of research for this book and it shows. He's really done a lot of detective work, digging up old files and documentation, as well as talking with friends, colleagues and family to get a well-rounded perspective. The narrative flows really well and provides a comprehensive look at Swan, from both a personal and professional perspective. Interestingly, I came to the book thinking the art would be problematic. Not that Swan is a bad artist, by any means, or that there wouldn't be enough to fill the book. Quite the contrary actually. Because he was so gifted and, as I noted above, consistent with his portrayal of characters, it seemed to me that seeing page after page of the same Superman would get tiresome. It worked in the comics because he was telling a story, but to pull the images out in isolation struck me as having the potential for being repetitive. Naturally, there is a great deal of Superman imagery in the book, but Zeno smartly pulls in a great number of other background characters to emphasize various points in his text, rather than just using Superman over and over. When he does put together a number of Superman images, it's specifically to focus on the consistency. "Here's a bunch of Swan-drawn Supermen that all look pretty much identical, even though they were created decades apart." Alternatively, "Here's a bunch of Swan-drawn Superman that look only slightly different, because they were inked by different individuals." I was pleased, too, to how many examples of pencil work was around, too. I don't think I'd really seen "raw" Swan artwork before, and it was great to see that it was as absolutely gorgeous as the inked version are. If I were to take any issue with the book, it would be the inclusion of all the interview transcripts towards the back. They were good in that you can see the authenticity of the details Zeno got about Swan's life, but a lot of them sounded repetitive as EVERYBODY said what a great guy he was. The Jerry Ordway and Dan Jurgens interviews were able to go a bit deeper, so those were a bit more engaging, but I could've done without most of them. As I said, they did serve to legitimize Zeno's research and, to a lesser extent, highlights how well he was able to refrain from including every little anecdote in his broader story, but his writing stood up to that on its own, I felt, and didn't require the additional support. That said, more info is better than less, and I did welcome getting to know Swan a little better, even if only by proxy. I was never the biggest Superman fan, but Swan's version is definitive as far as I'm concerned. That Swan himself was such a great guy is that much more fantastic. I think he remains a sorely under-appreciated artist, and would encourage folks to check out his work and his life.